Knowing fact from fiction can mean the difference between success and failure in your negotiations. 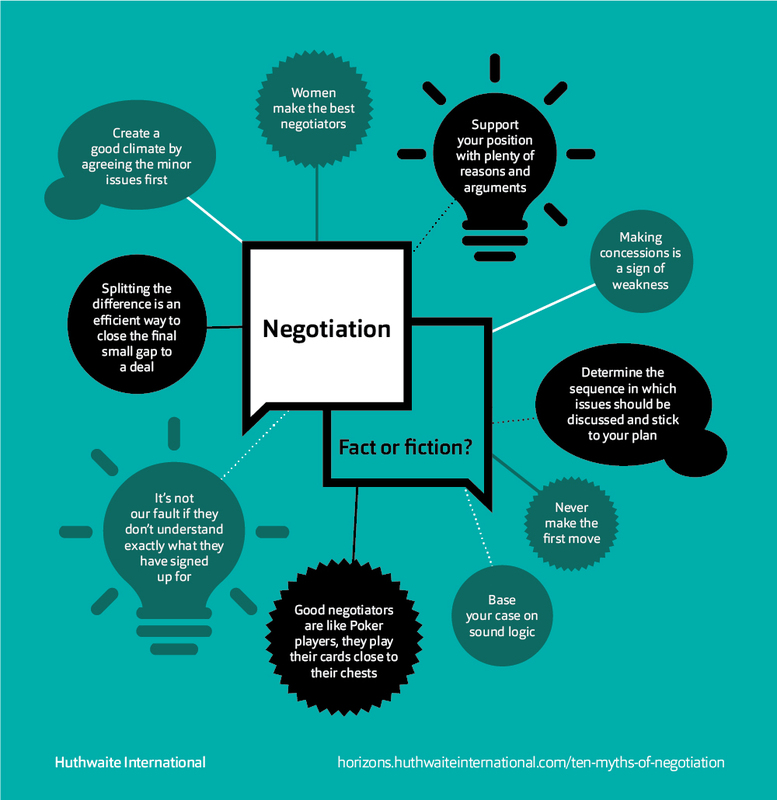 Here Huthwaite separates the top 10 myths in negotiation from the truth, once and for all. Learn about the behaviours that make the biggest impact as well as those best left alone. Identify bad negotiation habits within your organisation and gain greater clarity on what to do instead and why. Fact or fiction? Many negotiators fear that making the first move will appear weak and increase the risk of getting a poor deal. Our research reveals that far from being reluctant to make the first move, skilled negotiators are happy to do so. However, skilled negotiators make an offer to move on their position on the condition that the other party gives them something they want in return. What’s more, these trades are carefully planned in advance. Skilled negotiators spend more time than their average counterparts planning how to get the other party to give them what they want. Fact or fiction? Concessions are neither positive nor negative; it is how they are used that matters. Giving away concessions is not skilful, but a planned early concession can be used to engender a positive climate for a meeting. Granting unconsidered concessions is dangerous. If the negotiator doesn’t know the cost to the business and the potential value to the other party, they can give away far more than they initially perceive. Skilled negotiators will always trade rather than concede. Fact or fiction? While it can be a sound strategy to open discussions on a non-contentious issue to help develop a positive climate for the negotiation, it is not wise to discuss and settle all the minor issues first. Skilled negotiators use issues, where agreement should be relatively easy, as trades to help them get movement on the more difficult issues. This helps to maintain a healthy climate when it comes to the issues that really matter. Fact or fiction? Planning any kind of project is usually a logical process, with a strict timetable of events that need to be tackled in sequence if the final outcome is to be achieved. So it’s not surprising that many negotiators bring this logical step-by-step approach to planning negotiations. This approach rarely works in negotiation because the other party may have a very different plan with a completely different sequence of events they want to discuss. Our research reveals that skilled negotiators are more likely to consider each issue in isolation and plan how to handle it irrespective of when it might be discussed in the negotiation. This approach gives them the flexibility to handle any issue at any time. Consequently, they are not caught off balance if the other party raises something unexpectedly. Fact or fiction? Skilled negotiators are certainly very careful about the information they give to the other party. The saying ‘knowledge is power’ is certainly true in negotiations and skilled negotiators give half as much factual information during negotiations as average negotiators. Surprisingly, there is also evidence that skilled negotiators give far more information about their feelings and motives throughout the process than their average counterparts. These comments are used to influence the climate of the negotiation and to send clear messages to the other party about how the negotiator feels about the progress of discussions. These feelings commentaries can have a profound impact on the negotiated outcome. Fact or fiction? It’s natural to want to justify your position during negotiations. Throughout our education we are taught to do this. But, it does carry with it a potential risk. The more reasons we give to support our position, the more likely it is that one of them will be open to attack. Huthwaite research shows that skilled negotiators give far fewer reasons than their average colleagues. They put forward one good reason and stick to it. If the other party is unable to undermine this argument there is no need to advance any others. So if you have a good solid reason for your stance on an issue, stick to it. Conversely, we found skilled people are more likely to ask the other party for the reasons behind their position. Seeking reasons in this way may help them to undermine the other party’s position if they are injudicious enough to put forward a weak argument. Fact or fiction? Our observations show that logic is not persuasive. If you don’t believe us just watch an adult arguing with a child. The adult will present all the logical arguments while the child simply keeps repeating that they want something. The result, all too often, is that the adult gives in and the child gets what they want. The problem in negotiation is that what seems entirely logical to us may not be logical to the other party. Their view of the situation will have been influenced by an entirely different set of experiences and beliefs. Remember too that presenting logical arguments can lead us into the trap illustrated in Myth 06: presenting the other party with an argument they can undermine. Fact or fiction? In the quest to get a deal there can be a temptation to leave out or gloss over some difficult issues. Some negotiators can be tempted to move on even though they suspect the other party hasn’t fully understood an element of the agreement. Skilled negotiators are less likely to do this, indeed they will often return to an issue even though agreement has been reached to ensure there is maximum clarity about what has been agreed. The research reveals that skilled negotiators check understanding and summarise discussions twice as often as average negotiators. Skilled people are keen to ensure that the deals they make will be implemented successfully. They recognize that misunderstandings during negotiation can lead to either implementation failure or a need to re-negotiate the agreement later. Fact or fiction? When the agreement is within reach, it can be very tempting to try to bridge the final gap quickly and easily. Negotiators can do this by offering to split the difference with the other party - often referred to as ‘horse trading’. Splitting the difference can be a risky approach for two reasons. It involves making a concession rather than trading positions. The cost of this can be the difference between a good deal and a bad deal, as it will impact directly on the profitability of the agreement. All too often the full impact of this concession becomes apparent during implementation. When we offer to split the difference, it is likely that the other party will accept the negotiator’s move, but then offer to split the difference between the new position and their original one. As a result, the negotiator will have moved 75% of the way to close the gap. Hardly the 50 - 50 outcome they were looking for. Fact or fiction? It is often said that male testosterone gets in the way of a good deal. While women are more tolerant, prepared to listen and more likely to strive to solve problems. Men are looking to win even if that means the other party has to lose. Women are more likely to aim for an agreement that is win/win for both parties. Huthwaite research found no evidence to support these views. All our data shows that effective negotiation is down to skill, not gender. Adopting the skilled negotiator profile, whatever the gender, will have a positive impact on results.